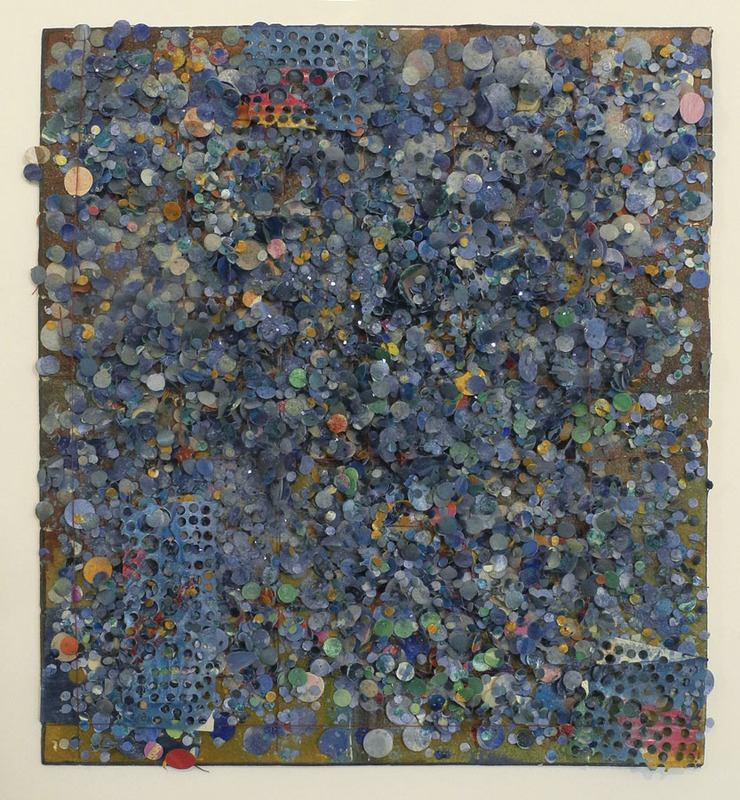 Untitled #19, 1977; mixed media on canvas, 93 3/4 x 74 1/2 in. 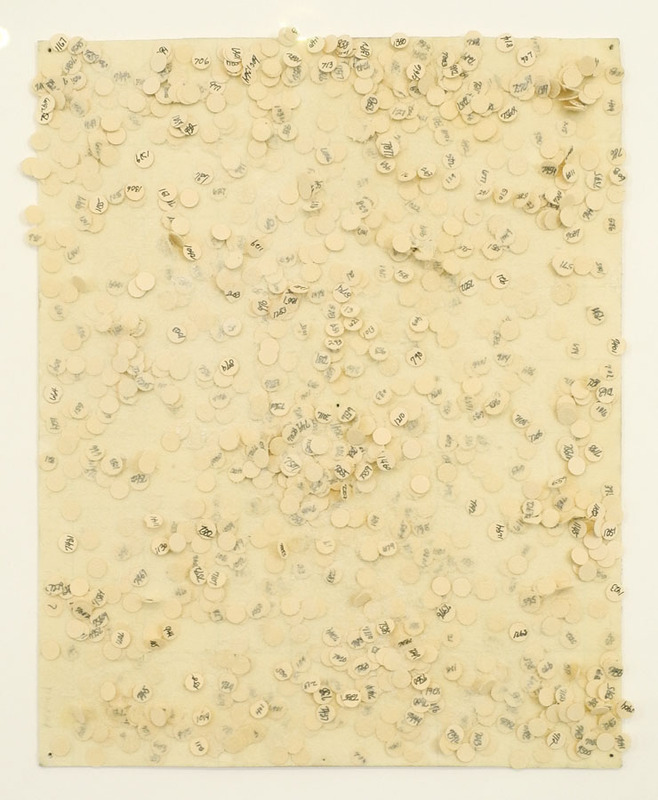 Walking into the Garth Greenan Gallery's large room, I saw a group of seemingly monochromatic paintings, irregularly shaped, hanging like fabric, held to the wall by nails. 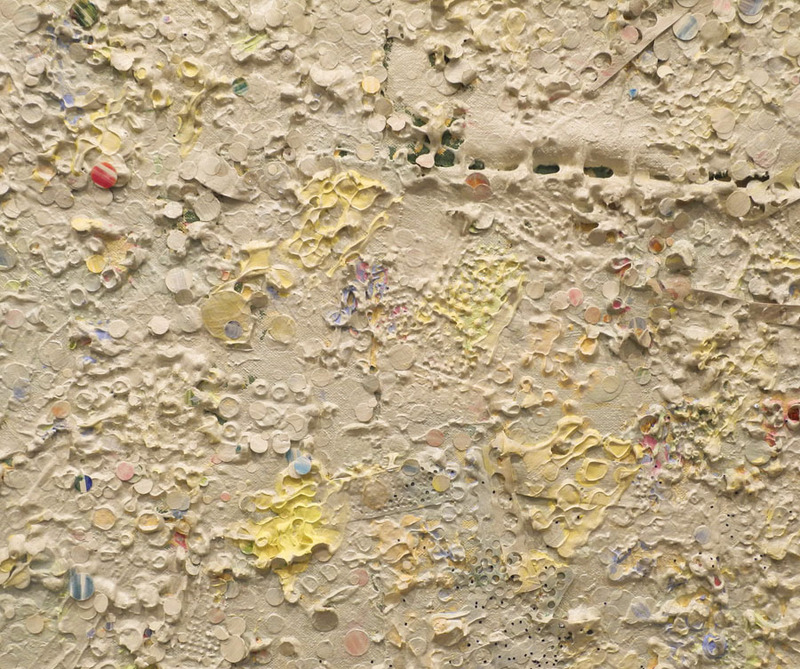 These intriguing paintings are the work of Howardena Pindell, made between the years of 1974 and 1980, and are full of light and air and shimmering surfaces. 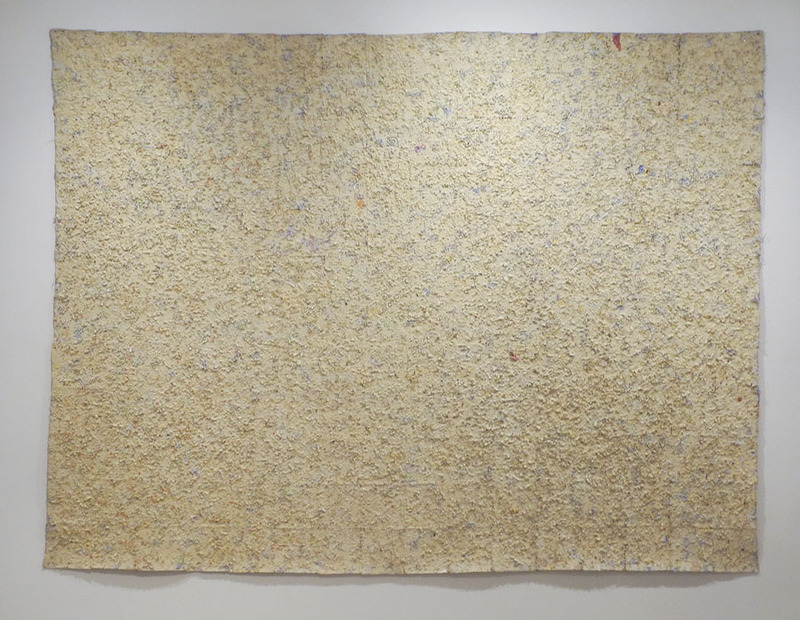 It was not until I walked up to the paintings that I got a sense of the intense process by which they were made: the canvas sewn together from smaller pieces, the paint laid on over and under bits of punched paper circles and sequins, adding to a complex, yet subtle, layering of color and texture. 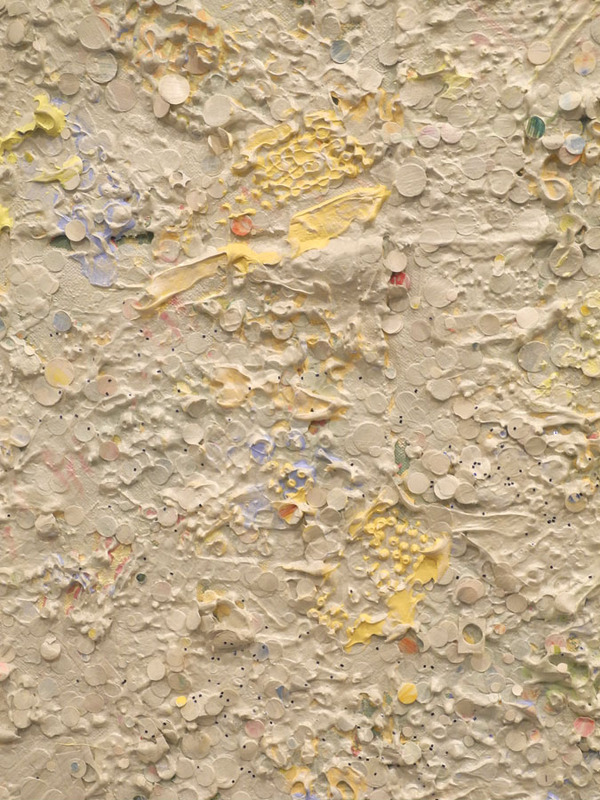 Different incidents of color, shape, and texture occur across the large surfaces, rewarding an eye wandering about. 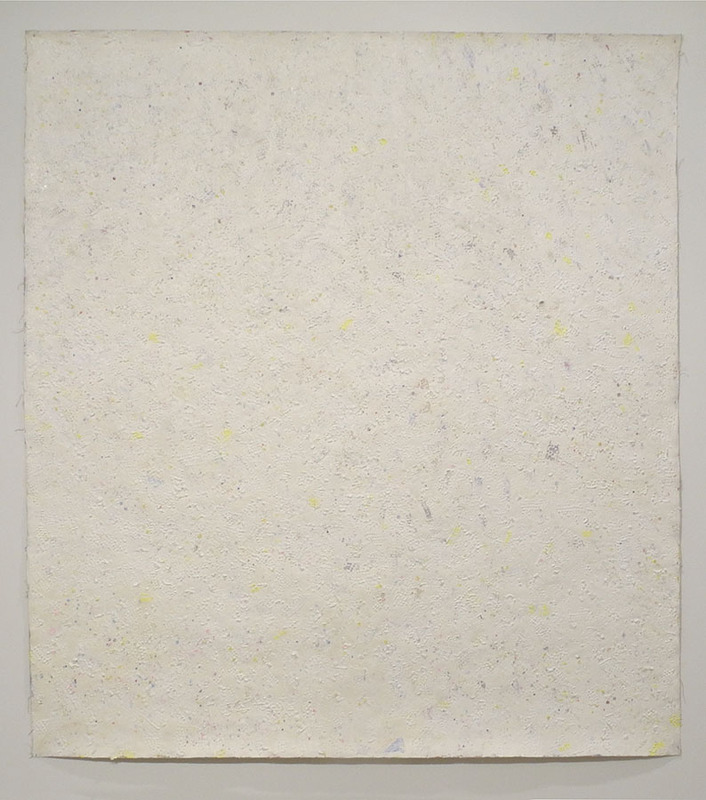 Untitled, 1976; mixed media on canvas, 91 1/2 x 93 3/4 in. ...has a landscape of forms scattered across its surface. 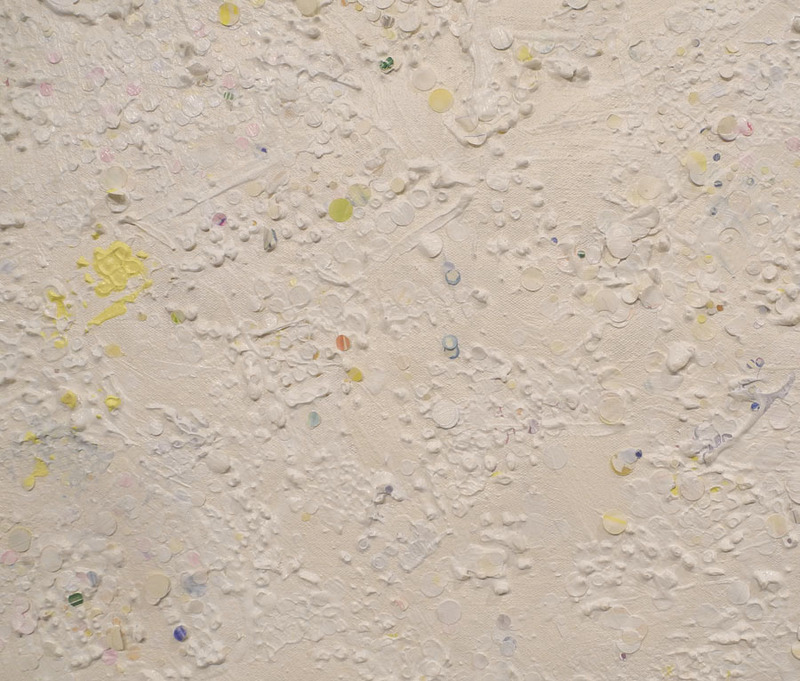 Circles are covered by paint or are attached as tiny rounds of color. 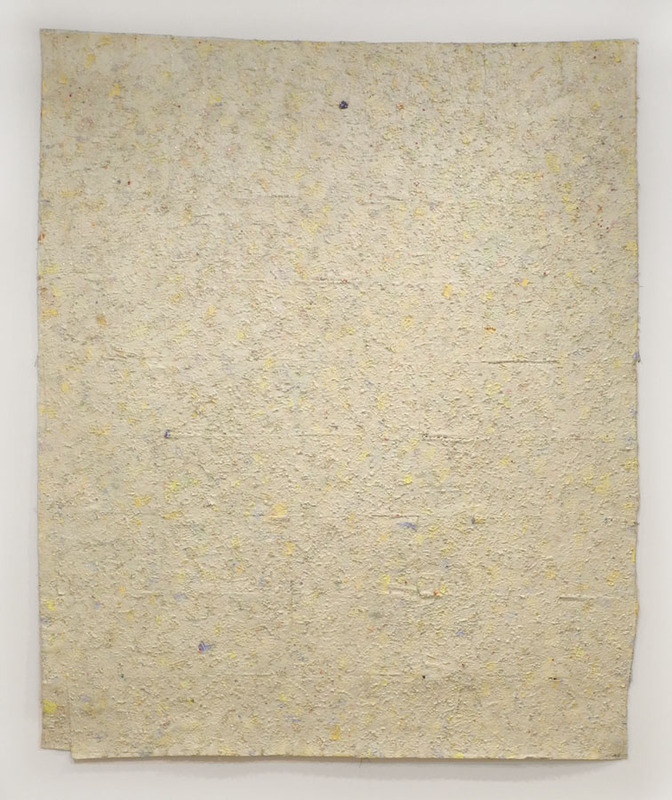 In this painting (it helps if you click to enlarge) you can more clearly see the grid that is created by Pindell's sewing canvas pieces together for a large work. It makes an underlying structure for the fluid handling of paint and paper. 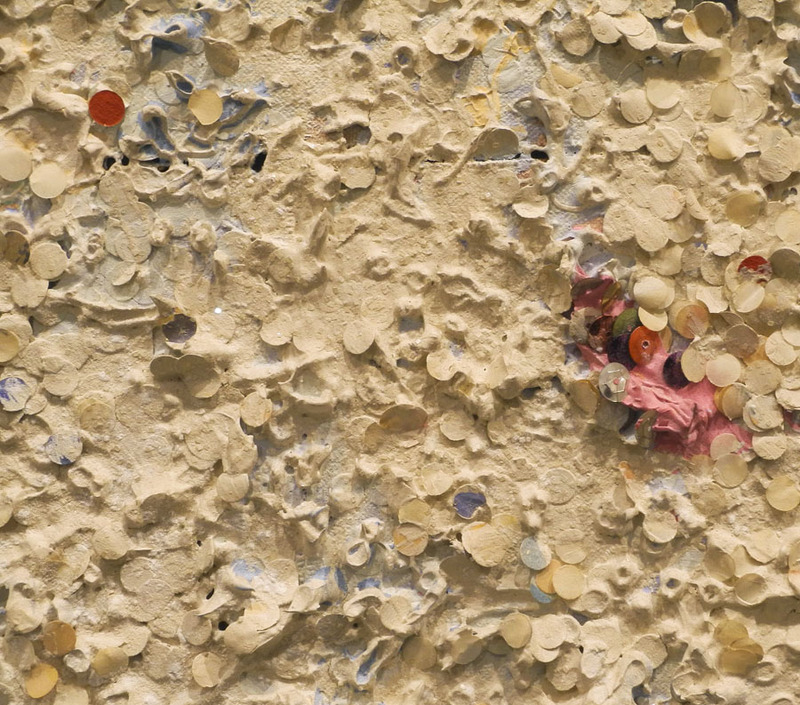 I love seeing the rounds of sequins or paper embedded in paint, looking like a molten surface, seething with movement, the circles embedded this way and that, creating hillocks and valleys and dark hidden places. Untitled #4, 1973; mixed media on paper mounted to board, 10 x 8 in. In another room in the gallery were several small works, which bring us closer to Pindell's technique. 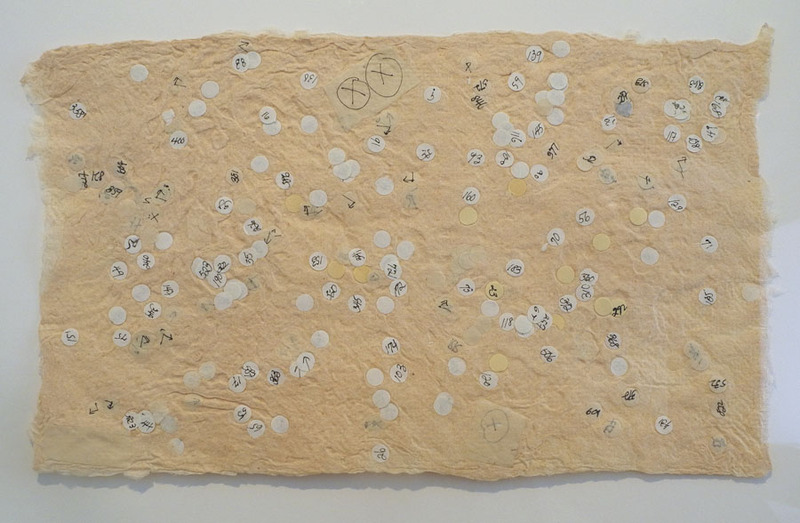 In #4 we see the punched circles of paper, many of which have numbers written on them, as though they are labels for some unknown items, found on some shop floor. Untitled #7, 1975; ink on paper collage, 6 x 10 1/4 in. But all those circles were punched out by the artist, all the numbers written by her. Untitled #98, 1977; mixed media on paper mounted to board, 10 x 9 in. The sense of a gorgeous accumulation was most in evidence in this work, which is more like a relief sculpture than a painting, the various hues of blues and greens, punctuated by warm colors, creating a shifting space. The papers are held in by thin red threads, which like the squares of canvas in the large painting, add a subtle grid. Untitled, 1973; ink on paper collage, 17 1/2 x 90 3/8 in. Finally, there is this stunning work, which looks like nothing much in a photo, though a little better if you enlarge it. Standing in front of it, however, you first see what looks like a minimalist work, with lines running across its long surface. 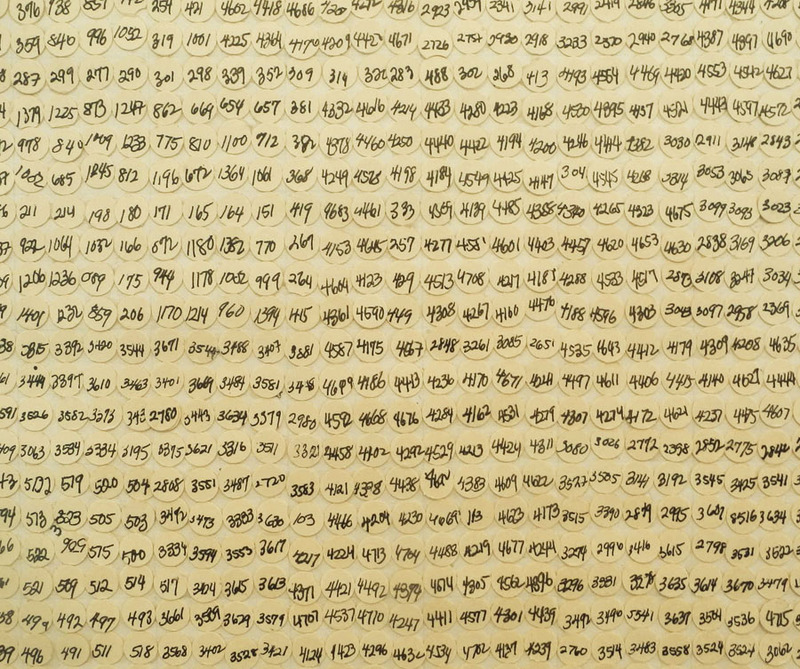 But up close, we see that the lines are created by text: numbers written on small punched circles laid out by the hundreds in rows. The prodigious amount of work that had to have gone into making this piece is overwhelming to contemplate. Since I am an artist who also does a certain amount of repetitive handwork in my textiles, I do understand that there's a certain kind of satisfaction in the process of making, a process that becomes calming and meditative; we don't have to think much about what we are doing, just do it over and over. 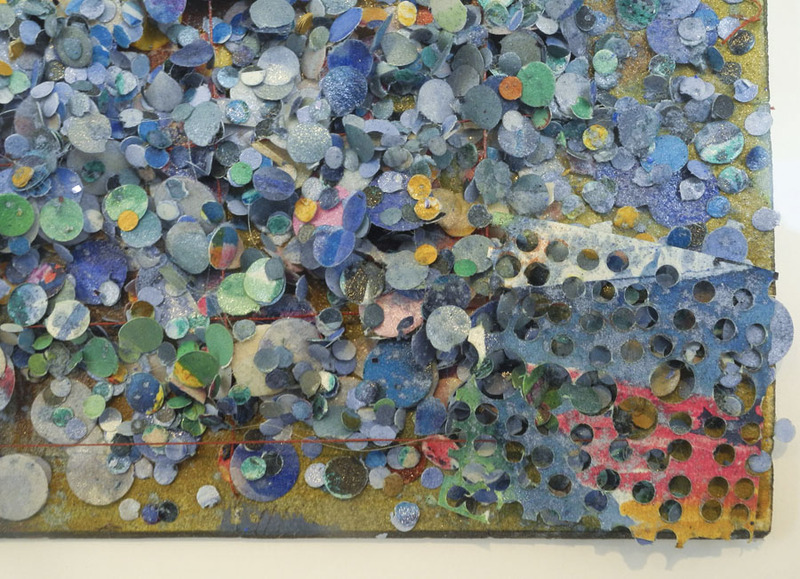 Howardena Pindell's work of this period combines that meditative quality along with one of turning ordinary materials into an extraordinary presence, an aesthetic experience of a high order. "The Great Beauty": "...roots are important"
A New Painting: "Red Flip"
A New Textile: "Divided Circle"
A New Cardboard Print: "Circled"
A New Painting: "Yellow Teeth"